Einstein to Bohr:"God doesn't play dice"
Bohr :"Stop dictating God everything"
I have always been tormented by the question of how the world works, into which I was born in. My life made me an architect instead of a physicist, which does not make it easy to answer my original question of how the world works. Even as a child, I had a great imaginations, which I later, as an architect, could further develop. Although the question remained, the visions piled up. These also showed me the wrong ways of school physics. To organize and structure my more and more complex imaginations, I decided according to the ancient method of Aristotle; Thesis-antithesis-synthesis to build a theory from scratch. I recognized the main problem: A student who learned classical physics, pushing his capebility to the limits, does not want to give up the hard-gained knowledge without the last defense. The heavy weight of all the laws never gave him the chance to fly directly there, where few famous and gifted physicists arrived at end of their lives. The extremely difficult theories of physics created paradigms that gave rise to today's paradoxes. A paradigm shift in history is hardly feasible under 100 years developing of counsciousness. Thus my theory here never becomes granded in my lifetime. All what I want is just a stimulation for great spirits. To make a first division of the field types, you should start with the field type, which can be the medium for all the others. It is the field space size 1, which is considered to be the perfect emptiness of the universe. Its size (size 1) is to be seen as an axiom and has only a relative justification. If we go through the scaling of all sizes, the tetra- and octahedrals show 2 properties. The field sizes of the odd numbers are capable to build equilibrium, those of the even numbers show up as an impulse transmitting structure. Below the size of 1 it is rapidly unbalanced. The matrix as the basic structure of the world's oscillating reality in space, time and force (pulse) shows logically and clearly: it is a medium that was created by the universe and in turn creates the universe. The always equal distances of field centers is probably the Planck´slength. This let expected incomprehensible forces, what cancel out each other to a balance of a zero result at the same place (Planck´s length is zero, since there the measurability ceases) and therefore it has only a theoretical size. The tetrahedral / octahedral structure of space size 1 are considered the field type of the empty space. Photons of size 1 would be swallowed there. Force momenta of excess energy would have to be >2 to expand into the size 2 field space. In experimental physics, I assume photons deal with excitations of sizes >1000. This field type is one of the weakest except gravity. The state of aggregation is dependent on the charge fields of the fermions. 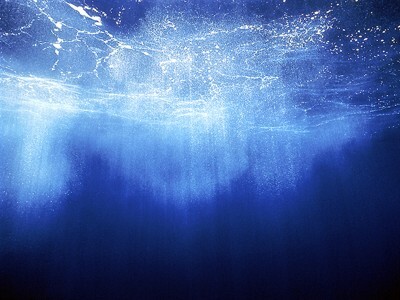 The liquid state depends on the "solid" state. The state of gas depends on the state "liquid". There are probably even weaker types of field, which according to current knowledge but belong to metaphysics. They are likely to be the transition to the etheric world, responsible for telekinesis, etc. in transition. As I said, today we actionably have not arrived in the new age yet. Julian Schwinger assigns this field type in its QFT to the bound fields of the EM space. I believe that is correct. However, according to Schwinger, this type of field also includes gravitation. I don´t believe physicists could see this connection without assuming a matrix and its 4D vector oscillation. It is in fact the collapse as described above under “inertia and mass”, which causes also in the area of the charge field an indentation of the space in the direction of (+) time and (-) time. This new oscillation comes as the 5th condition to the local system. The sum of this state is not according to common physics (-) or (+) but (+ -) = zero. Although it sounded at the first glance illogical, it is logical if assumed a simultaneity in the local system, what has an effect that instead (-) it becomes (+ -) and connects to the fields (- +) instead to (+). Although this connection is only ½ cycle, it is completed with the next ½ cycle, a local equilibrium is reached again. If field A has the cycle (+ -), it connects to field B of (- +). The effect is the same as in the official physics, but does not need a new constant called "charge".Thus, in matrix-field theory, repulsion and attraction in the subatomic domain are always determined by this phasing. But why don't the phases cancel out each other? Well, these fields are actually a vibration in the 4th dimension and have only limited effect in the EM space of the 3rd dimension. It is a depression / compression of time and space. The EM space can be imagined as a rubber mat, one side of which draws tension and the other side pressure. The picture above shows a fermion with (thin blue lines) its influence in the 4th dimension against the (+) and (-) time, which will be discussed in detail later. Red here is the oscillation against (+) time and yellow against (-) time. The arrows of the coordinate "space" symbolize the 3D space. There, the vibrations propagate and become carriers of the states of aggregation. The oscillation shown is also symbolic and has further field potentials for the fermion, which have not yet been experimentally proven. All these vibrations are bound fields in EM space. General is the 3D space build by matrix fields size 1. For to complete the cycle of a field by geometrical logic, 4 colors are requested, oscillation moments in 2 time directions must be considered: (+ + | + -) and (- + | - -) . Thus, from view 4D, there is a (+) time side and a back side as (-) time. It is the rubber mat described above. As in the topic "Criticism of the concept of electric charge" it is its center, the previously described deficiency color, what bends the moment of an excess force in the 4th dimension. As already suggested in the topic "Criticism of the concept of electric charge", there is a kind of bridge to the 4D space in the field constellation of an octahedron. It is it´s center, the deficiency color described above, that bends the moment of surplus power into the 4th dimension and creates a new 3D space there or interact with an existing 3D space there. The middle tiled surface represents the 3D-space. It shows the up bent deficiency colors in the 4th dimension to the 1st energetically higher 3D-space. In the central blue octahedron, the 3 perpendicular lines demonstrate the bending. This 1st neighbor space in the 4D was also tiled like the 3D basic space. There again could be created a new space of octahedral. Its deficiency colors bend into the energetic 2nd 3D space into the 4th dimension. There the same process takes place in the third energetically higher space. The compensation (energy exchange) of energetic disturbances in the basic space are bosons or photons. The required local simultaneity does not stop here and spreads to the neighboring 3D spaces as well as to the (+) and (-) time. 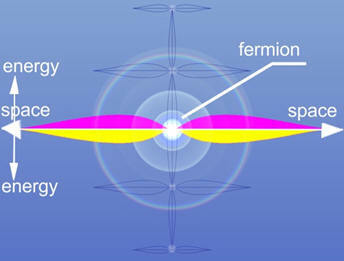 All fermions are fields with a tensor in the 4th space dimension. From the point of view of the 4th space dimension, they have a bending of the field distances in the center of the octahedron. This bridge into the 4D neighbor spaces make their field in the EM space to become local and convey inertia, which is also valued as rest mass from common physics. The same tensor also causes the fermion to oscillate into (-) time, where it becomes its own anti-particle, which therefore becomes a complete cycle with the other half of the so-called SPIN. Of course, this "SPIN" is simultaneous, but since the mathematical evaluation (Dirac equation) takes 4 values (which becomes visible in the matrix), π / 4 was calculated, it means after a cycle of tension/pressure is only ½ SPIN assigned. The new Matrix-Field-Theory (MFT) does not classify the quarks as fermions, since the quarks are only a result of violent fragmentation whose broken energy (as described above) can escape only along the 3 matrix vectors x; y; z. as I will describe in detail later. These, like bosons, have 3 different energy levels, which can be seen on the boson illustration. A fermion is not just a shell (today's physics) but a full cycle with its own anti-proton. The geometry of the matrix offers various field shapes units that could solve the problem of charge as space-time-momentum oscillation. Octahedral have their deficiency color in the center. Through them, the energy exchange with the neighboring spaces of the 4th dimension. This vibration is not simultaneous. From the true point of view of the 3D, it looks like this: The 3 vectors of the octahedron (its diagonals) generate the impulses to the center, which as excess energy creates the collapse, which invisibly discharges (from the 3D view) into the neighboring 4D space, then swings back and in the same sense discharges itself into the neighboring 4D space of the opposite side (here in the (-) time). The succession of the two oscillation periods generates the tensor field and therefore the bending of the space-time pulse, here as a charge field. In the picture 4 tetrahedral (red) complete the octahedron to the unitary form (as a tetrahedron) as a typical vibrational form of the matrix. 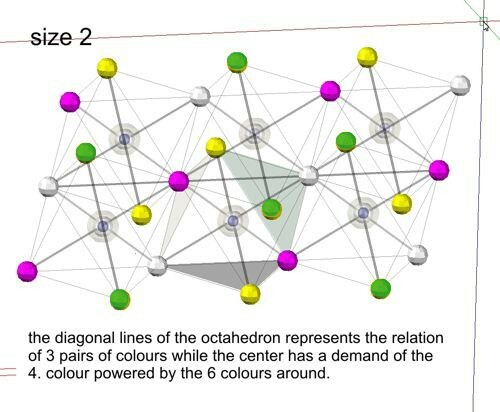 If the octahedron (blue) is supplemented with 8 tetrahedral formations, then the addition of a second octahedron in the center is also permitted, since the vibration phases of the deficiency-colors are not simultaneous but consecutive. So all the oscillations described above now become simultaneous and cancel the pulses (+) and (-). It is the favorite form of Nassim Haramein, which he liked to refer to as perfect equilibrium. The forms of fermions, which are idealized as matrix units, are characterized by local simultaneity. The connected charge fields have their own simultaneity, which is spatially thousands of times larger. To what extent these connected fields in the measuring method of the experiments (MeV / c ^ 2) received, is not conceivable for me. These measurements of physics make no sense to me in this detached form. All measurements should really have only quant numbers as dimension. In order to achieve a more exact representation of the phase mechanics in the cases "lepton proton neutron", our 3D space becomes in this depiction reduced to a 1D line. The bending in the neighboring 3D spaces located in 4D became visible in the vertical coordinate. Since in this representation of the 3D space as a line the involved fields are not readable, their number but is marked in the levels of the 3D spaces as a pair of numbers, where the first number is the generated fields created by the deficiency colors and the second number the number of involved fields, which are responsible for the generation of central deficiency color, here also called manko color. It is conceivable that there may be even more constellations that extend further into 4D space, as nuclear research shows to us. But for to understand the concept; it is sufficed to present in this way the stable combinations that create our world. A review of the above-mentioned fields clearly shows a concept. 1. All fields are based on a medium, Equilibrium of tetrahedral size 1-3-5 etc. In principle, all fields are assigned to the phenomena of the matrix. However, two types of field require special treatment, the electro-magnetic (EM) field and gravity. What are their similarities? Ad 1. : While all upper fields are based on an impulse increase, the EM field and gravitation change distances of matrix fields in the same way as the nodal distances of a rubber net or mesh change under pressure or tension. Ad 2. : Both fields are linked to the event, which is the cause of pressure/depression. These events result from the interactions with the neighboring spaces lying in 4D hyperspace. Ad 3. : Both fields are not dependent on the cycle of the causer fermions and are not bound to their simultaneity. While the fields between the fermions (bosons) are still within the range of simultaneity of fermions, and therefore in the overall cycle of the group, the EM field (starting with the charge field described above) and the gravitation can form independent cycles , hyper cycles where are much greater than the range of action. In practice, this means that their effects act as a static force without oscillation. The cyclic anti-effect (their anti-force) of the magnetic and gravitational fields is so far away from the cause, that until today engineering practice and science do not discovered their existence and reject it as a fact. The logic of the equilibrium but requires its existence. Here is an interim remark for the most curious ones: Since the anti-field of EM field is much smaller than that of gravity and can even be reduced by high voltage, the thousands of times weaker gravity field is compensated by the EM-anti-effect. 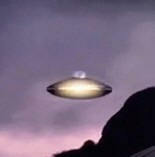 So a UFO flies! Military classified research knows that, but we will soon too. A step deeper in the subject will dive the 2 article as following. 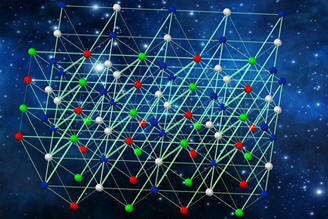 In the charge field, depression/pressure of the matrix field network theoretically acts as (+) / (-). Peak means (from above, the (+) time side) (+) charge, valley means (-) charge. From down underneath (the (-) time) it would be the other way around. The picture shows in the center the primary area of influence of interaction with 4D. The deformation results in a region in the matrix (in this case the horizontal line) which has a compacted area whose compensation directly occurs in the size of the Compton wave. While the central primary field is affected by the oscillation of the fermion, the field of compensation is only in harmony at its fine rhythm, but otherwise it has its own frequency. This is the charge field that oscillates with its vector (amplitude) in 4D. In the primary field and in the charge field, the vectors in 4D cancel each other out. The equalizing or compensation, however, happens with c and therefore has a vibration in the 3D space in the size of h (a quantum). It is the quantum that gives the charge quant-values. However, it cannot be called charge because it is an oscillation (+ and -) and not static. A simpler explanation can be given if the 3D plane is ONLY considered here as the horizontal centerline. The primary region creates a concentrated tensile zone (here, for example, as a 4D vector in (+) time). It is periodically neutralized and builds up again as a tensile zone, which but now is caused by the vector to the (-) time. So there is only tension and no pressure in 3D. Nevertheless, a corresponding pressure builds up in the charge area when the compensation wave strikes back from the edge of the Compton wave and when on the inner side the vector in 4D neutralizes and thus releases the tensile stress into the charge field and this itself added with the compensation wave. Important : Electric fields here could cancel Gravity, what is caused by the primery field by 4D. Thus, in the charge field an oscillating momentum takes over the property of a charge field. However, this is not a static charge but a centric polarization, which requires the counter-polarization of another field, here is it an electron. This means theoretically that the electrons work with the same processes. It should be mentioned here that a free compensation field always has the size of the Compton wave, even if the 4D-vector of a proton is much stronger than that of electron. Outside the immediate charge field, compatible subfields (in harmonic frequencies) form the fields of the aggregate states. Niels Bohr's periodic systems have many question marks. In fact, apart from the noble gases, it was hardly possible to derive any unambiguous references of the element properties to the atom number. This, however, can only be a question of geometry. Here is an attempt to represent the oxygen atom: The relative sizes of the radii are symbolic. 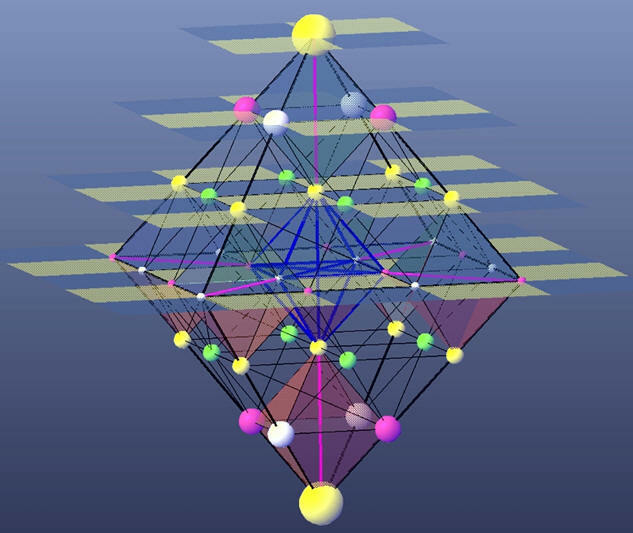 In reality, the symbolic tetrahedron as a marker of the field centers (blue lines) is much smaller and closer to the proton here the yellow sphere. For the sake of understanding, it should be explained that the fermions all have a period of 180 °, with one period passing in (+) time and the other in (-). This is the reason why the electron and probably all fermions here are not subject to the Pauli´s exclusion principle and can be a ½ period in the (+) time, the other in the (-) time, at the same place. Therefore, a potential (charge) field can carry 2 instead of 1 electron. Here the charge fields of the electrons ½ blue and ½ white are shown. The gyroscopic arrows symbolize the kinetic moment, which continues locally with the trapping of the electrons in the bond of charge. In the center is the proton, encircled by the now 2 electrons of the K shell, as the 1st orbit is named. 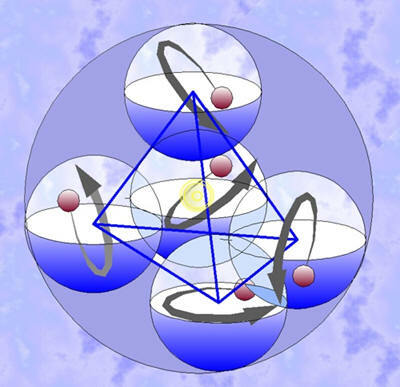 Surrounding are 4 fields of the electrons of the L-shell, whose centers correspond geometrically to a tetrahedron. 2 fields each carry 2 electrons, 2 fields with only one electron each, the missing electrons give the value of the molecule. Of course, I have chosen here a too simple static symbolism, which corresponds more to a children's drawing than the barely imaginable dynamic conditions and the interplay of fields. But there is more information than Heisenberg's probability model. The gravitational field is made by the curvature zone created by the 4D-vector-oscillation in the center of all charge fields. Although there is no charge field in the neutron, the curvature zone is still there, even if the oscillation pulse becomes equalized by itself. It forms a secondary field without oscillation, which therefore cannot interact with electrons. The charge fields of electrons and protons, on the other hand, equalize each other, the larger the field becomes. What is meant is the effect unrecognized by physics, that each field consists of a momentum h, which continues into space with increasing wavelength until its last moment h equals the ambient energy what means it becomes isotropic. These non-measurable weak fields add up, since the original oscillation of the matrix already ends in the primary field and from there forms the secondary field of size h or one quant. From there, the 4D-vector-oscillation cannot continue to propagate, larger and weaker fields in EM-space appear. The result is a process of multiple conversions of field properties that must be described in a separate article. Let me just say that gravitation is an additive and analogous field that results as interaction of the matrix by a cosmic scale. The equation of Newton covers only the first part of the whole process. As described before, the huge gravitational fields do not spread according to the Newton formula but end in the isotropic state of the cosmic environment. Then they form a compensation field (antigravity) until again an isotropic state is reached, in order to appear again as a gravitational field. It has to be considered, that h as a moment stays on as big the field size will be and still has effect. Hence gravity is an additive field, this unimaginably small effect is multiplied by an huge number what will make the effect of h visible. So far, the matrix field theory (MFT) in the individual articles has been gradually developed. Now the theory should be presented essentially in a short briefing. The closest packing of the equal space units creates with its center a 3D structure consisting of tetrahedral with gaps in the shape of octahedral. The number of tetrahedral is 4 times larger than that of the octahedron. Its volume is 4 times smaller than that of the octahedron. In this way they share the space 1 to 1. The properties of the spatial units are related to each other and create equilibrium of all properties. These are compression-depression as a contraction-inflation of space in the forward and reverse time periods. With these 4 properties equilibrium is achieved throughout the space. These 4 properties form a cycle of 4 phases in each space unit, each cycle forming equilibrium again with the 4 space units in the tetrahedral constellation. All cycles become the basis of time and pulse, with time and pulses forming equilibrium. Pulse is an invariable of the medium and is recognized outside the cycle as elasticity which, if it collapse, generates a vector in the fourth spatial dimension. The cycle is an invariable of the medium and generates the axiom “time" when the equilibrium is exceeded. As a result, larger cycles become possible, which inside simultaneity prevails, while outside the cycle time becomes measurable. General: There are 2 types of fields based on the medium of the matrix space; the fields propagating with c and local fields. The c propagating field: It only interacts quantum mechanically with other fields, in simple words, it is digital. All interactions are 1-dimensional. Even if fields could be presented as space, pulse transmissions can only be 1-dimensional. These fields have a cycle of 4 properties, but only in 2 phases. The matrix allows only 2 phases, as the time phases happen simultaneously outside the system. This field type has only one pulse transmission with phase 1 = compression, phase 2 = decompression in one vector. This was defined at the birth of the field (Birth of the Universe). The local field: It interacts on a subatomic and atomic scale with quantum mechanics (1-dimensional and digital) and on larger scales 2-dimensional (analog). Exceeding the capable pulse sizes defined by the medium does not create a collapse of matrix but causes it to bend into the 4th dimension in the center of each octahedron. The resulting values generate in the neighboring space of the 4D hyperspace again a 3D-Matrix, which if necessary, creates again by the same process 3D matrix in higher spaces (deeper in the 4D-hyperspace) by bending in vector 4D. This process happens in the 2 phases of a 4-phase-cycle, with the time phases being simultaneous or sequential. The primary field: The above cycle generates in the original 3D space an oscillation only from (+) pulse values ((+) -> + zero -> (+)).In the realm of participating octahedral, the primary field produces a space shrinking in the measurement method outside the field. The primary field has the same oscillation as the involved octahedral. The secondary field has an independent oscillation, which is generated from the tensile force (counter-reaction of the primary field) and the compensation wave, which falls back as a moment in the Compton wave boundary. It has the moment of 1 quant that acts in the whole area of the secondary field. It is mathematically already treated as an analogous size. The paradox 1-dimensional / analog can be imagined in a way that compensation spontaneously generates a string that annuls the pulse momentum. Because of the oscillation, however, it has 4 properties that discharge as 4 quanta. The tertiary field and other fields are built with multiple radius arround the secondary field. Each additional field has compensating quanta of the original field as an inheritance. and bosons are c propagating fields. They are a free running h-momenta. 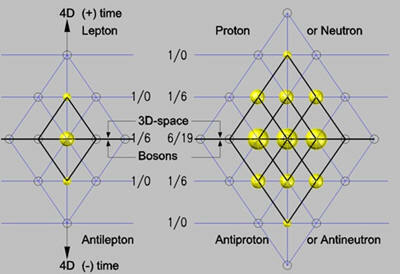 Photons are in the original 3D space at higher scales and bosons are in scale 1 and 2. Quarks are the rectangle strings that transmit pulse diagonally in the octahedral structure of the matrix. They do not make a field and are 1-dimensional. With Feynman spoken; they have zero degree of freedom. You have to consider, there is no other way out of a proton then along the x-x; y-y; z-z . Protons are local fields. They are octahedron structures (in the space scale 2), which have in their center the bending by vector in 4D and act also in the 4D spaces. They are surrounded by secondary fields that are considered as charge fields. Neutrons are local fields which unite the time-phase of two protons and cancel out the charge fields of both protons. Here it must be recognized that protons do not have a time phase (+) or (-) but a time phase (+) AND (-). However, the time phases do not cancel the pulse values of the phases, which causes the space-shrinkage in the 3D, the primary area. Electrons are local fields like protons. They extend their 4D oscillation in the space scale 3. However, this creates the same secondary space as the proton, since all fields resulting from a secondary reaction of a space disturbance always react with the moment h.
Neutrinos are quasi-local fields of the space scale 2. 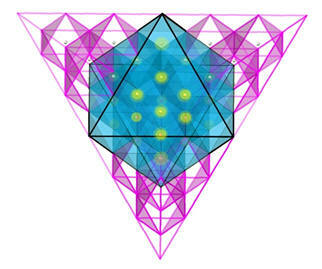 There its octahedrons have only one color and a cycle of Pi/4 and need 4 cycles to come again to equilibrium. They are actually Bosons, which transmit extreme high energy with light speed by their high frequency. Part. 4 will explain, what here is only presented as statements. Charge fields are secondary fields of the moment h with a periodicity (+) to (-), which are also called from the primary field as compression/decompression. They are not, as assumed in physics, static but periodic or cyclic and are 1-quantum references. Instead of the electron orbits, they are 1h proton fields, which alternate and equalize with the 1h electron fields. The electric current: The physics assumes that an electric potential on one side and an electrical shortcoming on the opposite side generates the discharge current. As expressed by Feynman, the electrons have a one-sided limitation on their degree of freedom, which roughly corresponds to reality. However, the new matrix field theory adds another important feature. Electrons tend to be linked to each other. These chains can be very very long and are the generators of the induction currency and flashes. To make this clear: The charge fields of electrons (including those of protons) oscillate from (+ to (-). The magnetic fields: The macro-chains of electrons can only be explained with the opposite-polar phases of their secondary fields. These in turn form the additive character of their tertiary fields, which are also polarized like the secondary fields, what means they oscillate. The additive total of their tertiary field of thousands of electron chains results in the polarized magnetic field. The magnetic fields are 1-dimensional and form again, but larger chains. They have now become analogues fields. The gravitational field: At the base of gravitation, the primary field, the shrinkage (contraction) of the original 3D space as a side effect of the vector oscillation in 4D is at the center of the octahedron of the matrix space. This primary field of Fermions is at the same time carrier of the inertia and therefore the basis of mass (m = inertia * v ^ 2). The secret of inertia in the primary field is not solved here, but the field distribution. The oscillation of the primary field is not directly transferred to the secondary field, since its vector is perpendicular to the 3D coordinates. Nevertheless, the secondary field has an oscillation, but in the following fields it becomes so slow because of its size that it becomes blurred or isotropic. After the complete disappearance of the oscillation, the other fields have only contraction, a common additive moment of all fields. This effect would soon no longer be measurable unless the unimaginable amount of fermions increases the blurring of all quantum mechanical values to the values of the original contraction and creates fields of contraction and their compensation fields in the great solar and also cosmic scale. After the loss of the original quantum character, fields are created on a cosmic scale with new properties, the 2D surface interaction (which replaces the original 1D interaction), a static field without oscillation. The individual fields in the Babushka system have the contraction (gravitation) and a compensation field. These are so large that the first field has the size of the solar system, which led Newton to formulate his formula as absolute and (1 / r ^ 2) dependent. A new cosmic field type like described above would make more sense, as it allows the so-called gravitational lensing, an optical effect of spatial distortion also in stars of sun size and not only in black holes. Also it would make more sense to account an isotropic behavior of a finite field, which after reaching its isotropy again forms an opposing field, which is required by the wave mechanics of all fields. It would definitely be a better solution than creating a new acting part of universe like Dark Matter. Christmas 2016 I began to describe my idea of a space matrix in the web page "The Field Space". In 2017 and 2018, the ideas in my mind and my 3D CAD platform grew into a zoo of solutions that demanded a logical order. In July 2018, I started to document these ideas in a Word with word and picture. Each topic actually produced its self and staggered me with their surprising solutions. I now realize that the MFT should actually need a team of partners, which of course is only a wishful thought. This Part of this theory should now become an extension, in which many Platonic solutions become quantified.